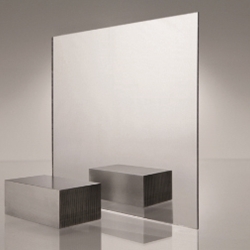 FABBACK® Acrylic Mirror is made from OPTIX® continuously processed acrylic sheet. With the process of vacuum metalizing, each sheet is given a mirror finish that is protected by the industry's toughest, most durable backing. Standard sheet is 48"x 96" with non-stock sizes available in 36" x 60" to 80" x 120".